Delays are not denials. The lesson of the day so far is that Trump’s delays on tariffs are good for markets while May’s delays on a UK vote for her deal for Brexit until March 12 is bad. What is the difference and are expectations about denials and time interlaced with politics? The Trump Tariff delays, Trump talking down North Korea denuclearization deals and China Banking and Insurance Regulatory Commission forcing increased lending to the private sector by 30%drive shares 5.6% higher in China, CNY to 7-month highs and Oil back to the highs for the year. The CBIRC declared victory on its debt control targets today. “After two years of work, various financial disorders have been effectively curbed,” Wang Zhaoxing, vice chairman of China Banking and Insurance Regulatory Commission (CBIRC), told a news conference. The lack of other big news stories leaves markets watching technicals rather than fundamentals for the next clue. The lack of supportive economic data hasn’t been the problem in 2019, rather it’s the reaction function of central bankers that on the margin drives and the all-clear from the FOMC to the PBOC to the ECB is in play this week. Delaying rate normalization has brought relief and comfort as the story reverts back to slow but steady growth everywhere without the burning inflation fears or the bears of recession. This won’t last as the business cycle can’t be denied but merely delayed. 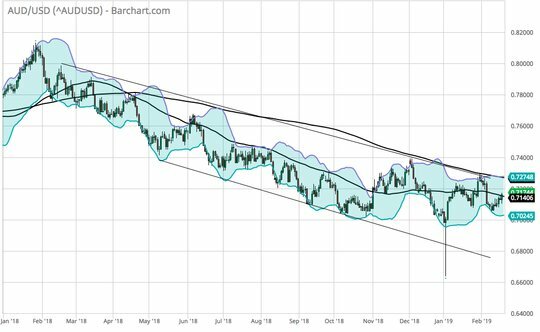 The best barometer for understanding the price action today is in the commodity linked currency world where hope for a trade deal overrides fears of deflation and housing bubble pops – with the AUD the front and center of the storm - wait for .7275 to confirm the risk breakout. Question for the Day: Is the problem in Europe more than just China growth? The bounce back in the EUR today and the relief in the periphery of Europe are connected back to the gains in China. The hope for a Trump trade deal drives away fears about an EU car tariff and restarts the hope that Germany and Italy are going to turn their growth woes around. The standard argument is that China growth matters more to the world than the US. The US divergence in 2018 is taken as proof of this point.